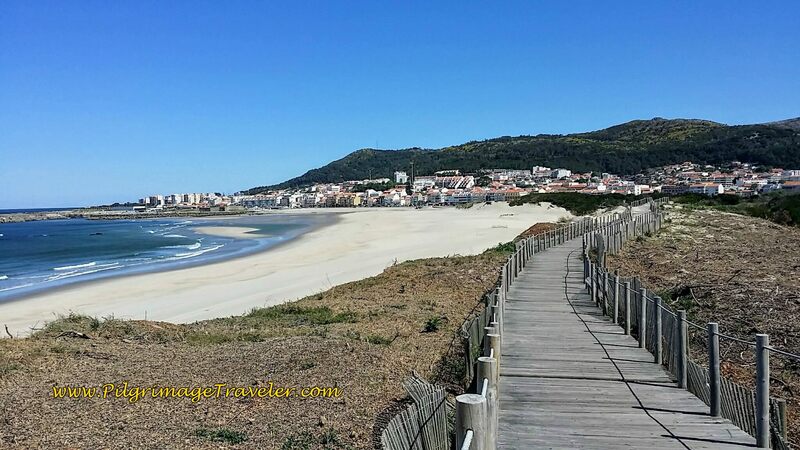 The Camino Portugués or the Portuguese Way is not a single route, but offers the pilgrimage traveler many options. 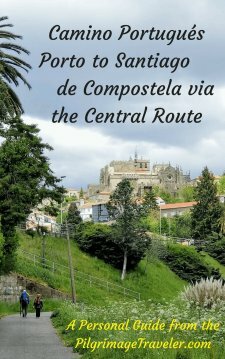 The main, central route travels 641 kilometers from Lisbon to Santiago de Compostela. The portion from Lisbon to Porto is approximately 400 kilometers, and from Porto, along the Central Route it is approximately 241 kilometers, and along the Coastal Route, a bit longer at 300 kilometers. 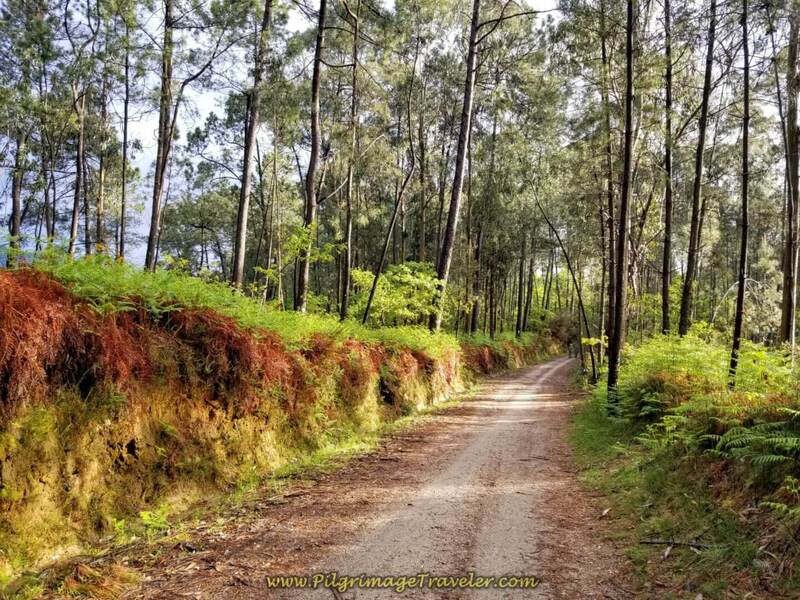 In our opinion, the section from Lisbon to Porto that we walked had an altogether different feel than the sections from Porto to Santiago de Compostela. 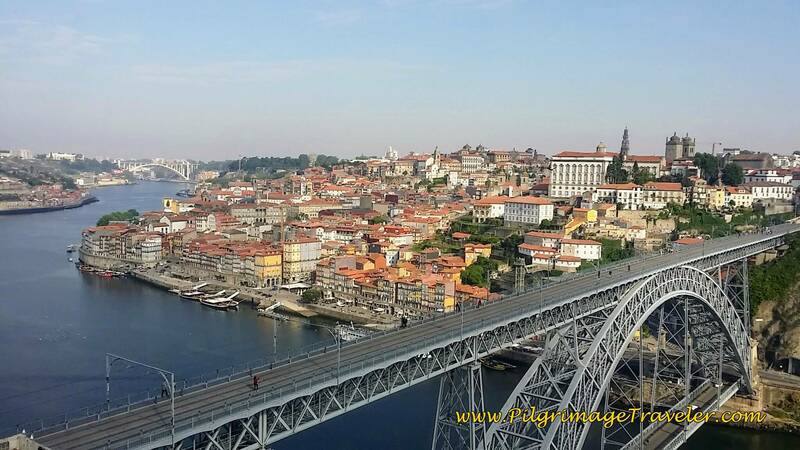 In our experience, they were very distinct Caminos, regardless of which route you choose from Porto. 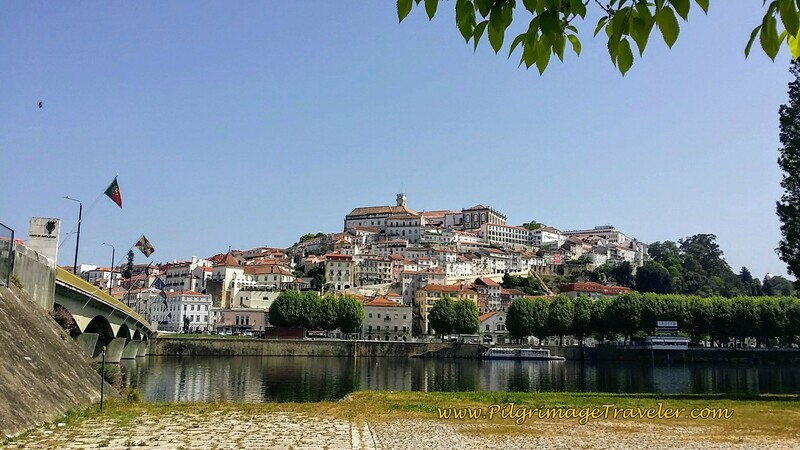 To add confusion and/or interest, depending on your point of view, there are three distinct routes from Porto: the Central, classic route, the Coastal route which rarely hugs the actual coastline and the Senda Litoral which does. 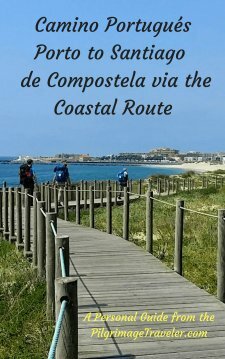 When we did the Coastal, we chose a mixture of it and the Senda Litoral, walking by the actual coastline only where it was practical. Then, add to the mix that you are traveling in two separate and unique countries, and the Camino Portugués from Porto has two distinct sections, the part that walks through Portugal and the part that walks through Spain. 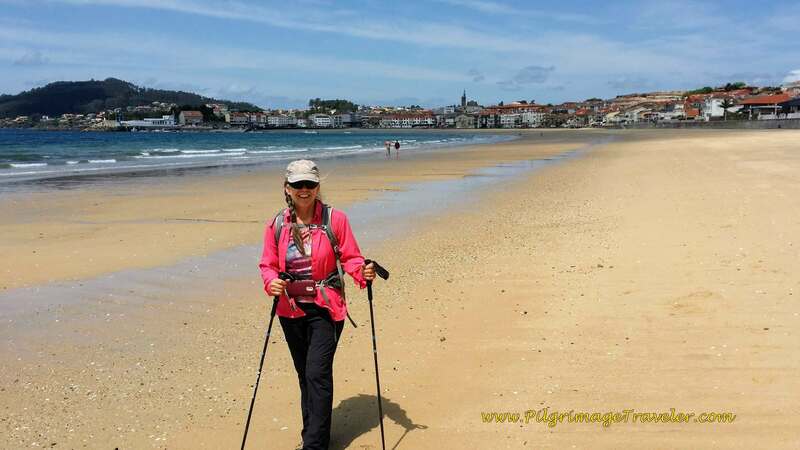 It is easy to see why I call this Camino, "the many ways of the Camino Portugues!" Provide a useful map of all the routes we walked. Give you the best accommodation guide that we found and used, for the entire Coastal Route, and separate information in our web pages for the Central Route. Attempt to dispel the myths surrounding the section from Lisbon to Porto, which we walked every single step of the way, and felt it was indeed a worthwhile experience. Give you, the reader, the opportunity to see and judge for yourself whether or not, any or all of this Camino is the right route for you! The Portuguese Camino rose to significance in the mid-12th Century, soon after the country gained its independence. Traveling on established cultural, economic and spiritual roads, often utilizing original Roman roads, the human bonds that were created then, as now, transcended political boundaries. Major networks of roads in Portugal were established along the Pilgrim's' Way, passing through Lisboa, Santarém, Coimbra, Porto, Barcelos, Ponte de Lima and crossing the River Minho into Galicia. Portugal's "Holy Queen," Queen Isabel in the 14th Century traveled to Santiago from Lisbon. Along with other nobles and high-ranking clergy, she contributed to the popularity and devotion to the Jacobean cult. Queen Isabel even offered up her crown to the altar in Santiago and was buried in Coimbra with a pilgrim's staff to show her devotion. Likewise, in 1502, King Manuel I left orders for a lamp to be lit around the clock in the cathedral of Santiago, as a memoir of his stay, and even assigned an annual payment to cover its cost. In recent history, the Camino Portugués is becoming more and more popular, especially the shorter routes from Porto. *Historical information taken from the brochure on the Portuguese Way, provided by the Portuguese Tourist Office. 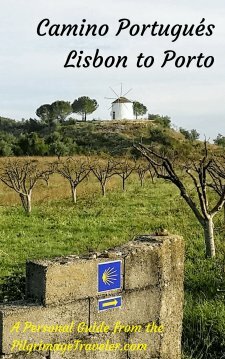 I geo-tracked my entire Camino using a cell phone application. Most geotracking apps primarily use GPS satellite information and very little cellular data. I know this for sure, because when my SIM card from Portugal ceased to function when I crossed into Spain, the app still tracked my steps. Free geotracking apps really work well, without having to purchase another GPS device. Finding my way when I wasn't sure where to go, I would use an overlay of another person's GPS data that I had uploaded to my geotracker maps. I could easily confirm that I was lost or right on track! If I was lost, I could find my way back easily using the map. You can do this with my maps as well, using Google maps, if you don't want to use a geotracking application. If you are outside the EU and wish to use Google maps and other data, you can purchase an international data plan with a Portuguese SIM card when you arrive. The plans are quite inexpensive. The good news is that now, the EU has made roaming inexpensive to all of Europe, so you will NOT need to get a new SIM card when you cross an EU border! Wow is that convenient! I used Vodafone for my data access and they have shops everywhere, at the airport and in every city/town in both countries. I just purchase a SIM card as soon as I clear the airport, on my way out. The staff insert the card for you, and it is a very, very easy process. OR you may just choose to stay disconnected! Below is the map I created with my geotracker application files, which I uploaded to Google Maps. If you zoom into the route, you may notice some points which appear to be missing. I tried to edit these, but the data points and files on Geotracker are not perfect, so you will see some holes. My total kilometers/miles figures are different than the guides and information out there, because we took the Coastal Route with some days on the Senda Litoral, which is always longer. Plus, we found out that despite the figures in the guides, the mileage was usually longer than stated. If you want a link to my GPS files on Google maps, just open the above map to the expanded view, click on the three dots to the right of the title of the map, then select "download KML." It's that easy. You will then need to upload the files to either Google maps, or another application of your choice! 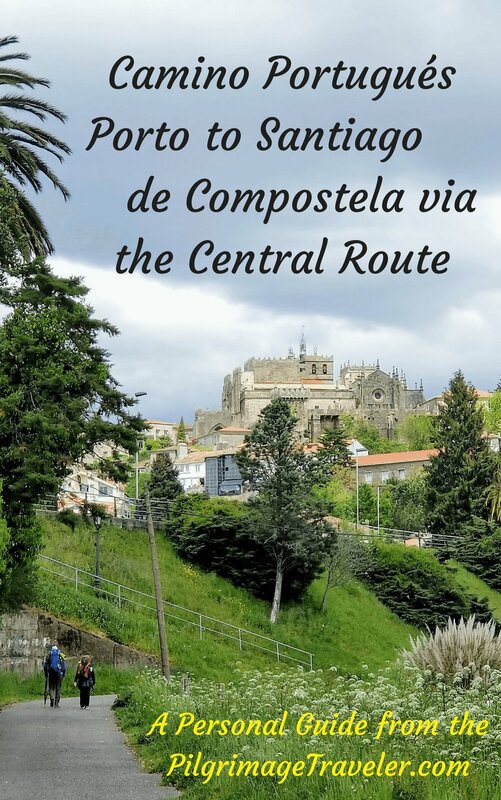 Prior to leaving for our Camino, I found on Ivar's Camino de Santiago Forum a gentlemen named Christian (cj2003) who put together an Excel file of all accommodations on the Camino Portugués from Lisbon to SDC! Wow! 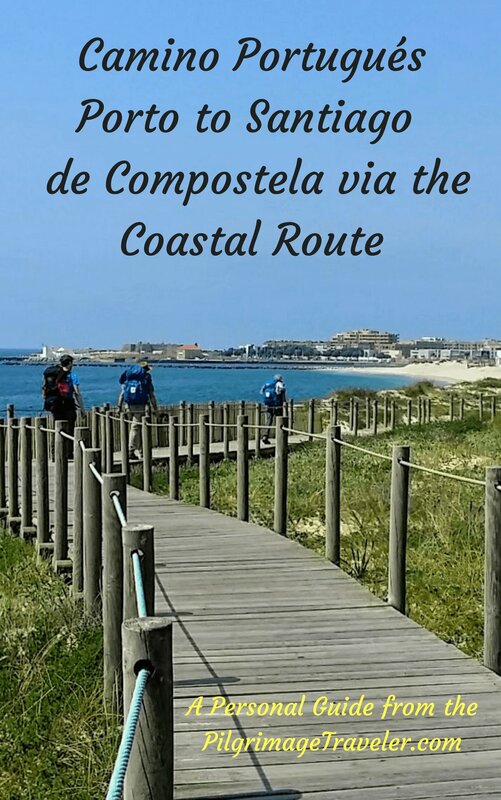 This file is for the Coastal route only which does include Redondela to Santiago on the combined portion from Porto. 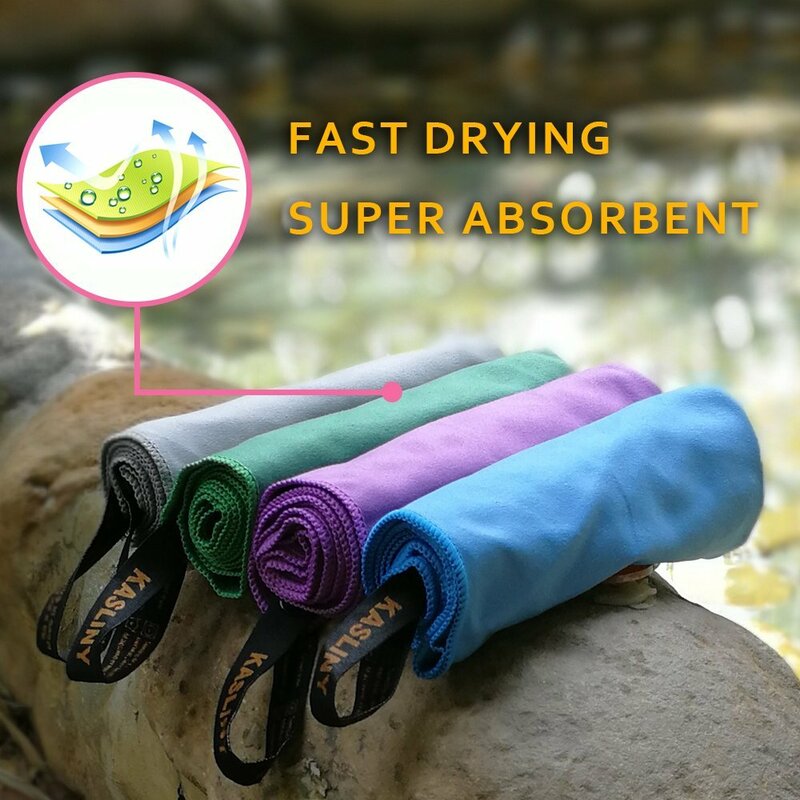 Click here if you wish to download this file. This file is continually being updated, in the resources section of the forum! The official Portuguese Camino Group, the Via Lusitana, publishes a list of albergues for the Central Route, starting in Lisbon. You can go to it by clicking here. This is not an exhaustive list for accomodations, but is for albergues only. To book ahead on any of the routes you can search for a city in booking. com. It's the best online reservation system, and I will earn a small commission if you reserve through my links. I thank you for your support. Some of the best advice on accommodations came from talking with fellow pilgrims and the locals. 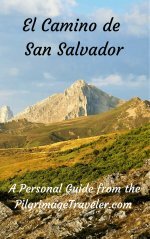 Plus, I hope that my web pages will help you plan your Camino as well as you read through! I have included accomodation information on the maps of my days on the Central Route, as I am unaware of any comprehensive file, such as Christian's file for this route. The Culture: While you may think that Portugal is a lot like Spain, I found that it is, and that it isn't! While you can find many similarities, it remains a very distinct country. I tried to use my Spanish here, with some success, but generally, the Portuguese do not like to speak Spanish. The People: We found the Portuguese to be the most amazingly helpful people. All you need to do is ask and they will go out of their way to be helpful. Several experiences we had, from a shopkeeper actually walking us to a shop when we asked where to find a product, to a local mason offering to drive our friend, who could walk no more, to the next town! This is an amazing culture which I learned to love and appreciate very much! If ever there was a culture in which you could walk alone and trust that you will be cared for, it would be Portugal. The Price: The price of things are even lower than in Spain. Two café con leites (same as Spain's café con leche, or coffee with milk) and two pastries often cost around 3-4 Euro, unbelievable cheap. The albergues almost always gave you real sheets, not disposable ones for under 15 Euro/person/night. Small family-run hotels, which we stayed in a lot, were 30-40 Euro, so why not have your own bathroom if there are two of you and it is so inexpensive? 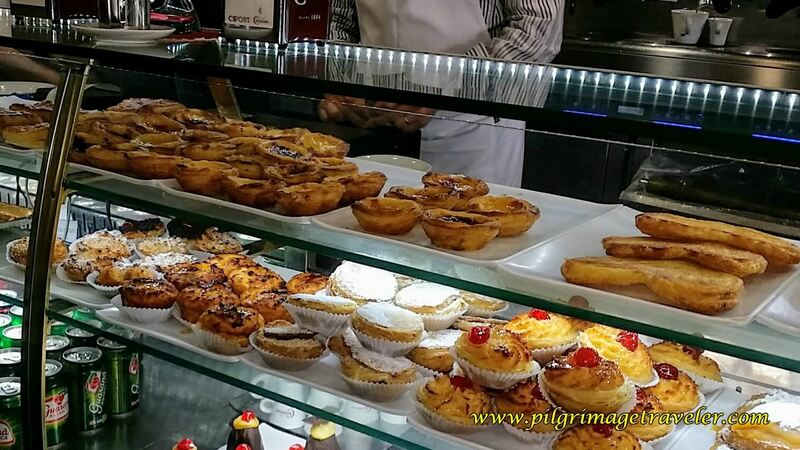 Pastel: The pastries are to die for, my very favorite being the Pastel de Nata (cream pastry). It is a lovely little custard tart that we ate whenever we could! While all the other pastries look fabulous, trust me, the Nata is the best! One of our greatest sadnesses came when we walked into Spain and no more Nata! 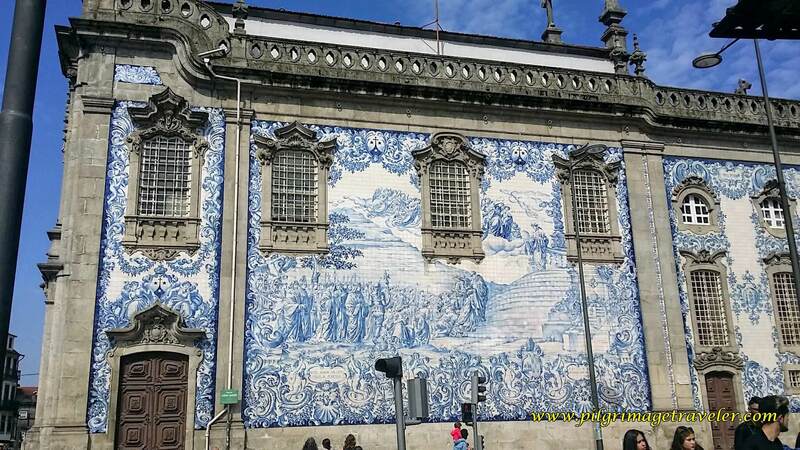 Azulejos Tile: The amazing murals that you see throughout Portugal, are made with the Azulejos tile. They are simply fantastic and unique to Portugal. Cobblestone: The Portuguese love their cobblestone. You find it in every town and in the most surprising places, like this country road below. It is so lovely, and yet so hard on the feet and ankles! You will find cobblestone everywhere throughout the country. I was never so happy to enter Spain for the sole reason that the cobblestone would finally end! And believe me, it truly doesn't end until you leave Portugal. Plan your footwear accordingly! Fátima: You know you're in Portugal when the most popular Camino is not to Santiago de Compostela, but to Fátima. We saw more pilgrims heading to Fátima than we did to Santiago! This was because the upcoming 100th-year celebration of the sighting of the apparition was in May, 2017. 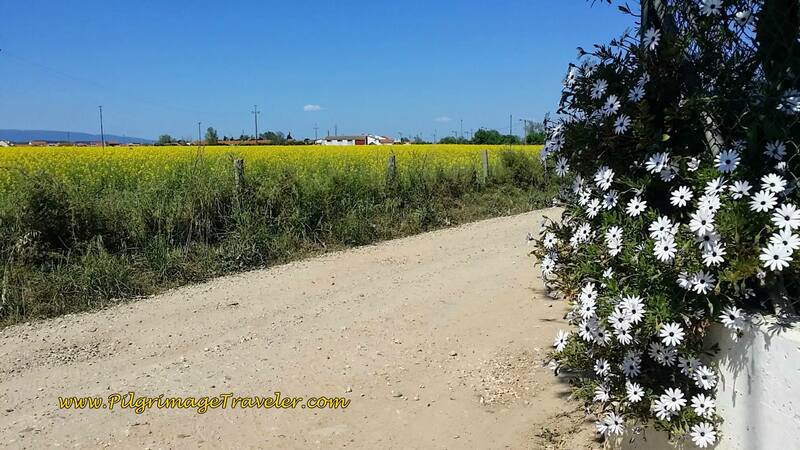 From Lisbon to Santarém, the routes are the same. Then the camino to Fátima splits. 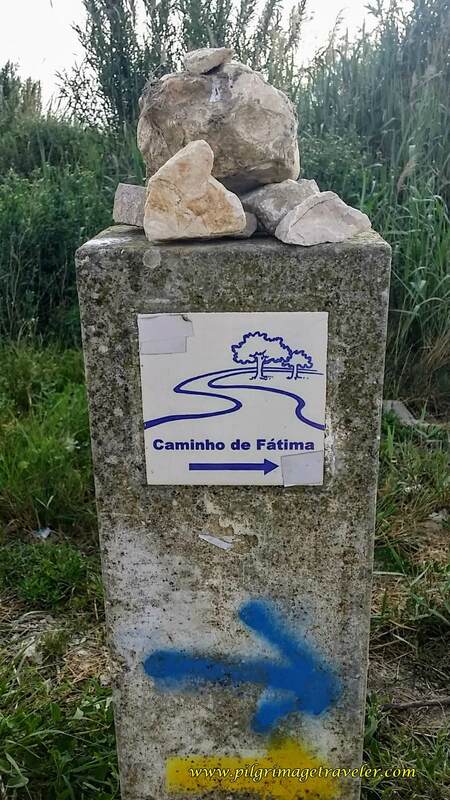 After Tomar, the routes and arrows are opposite directions as the Camino to Fátima heads south. You will see a yellow arrow pointing one way, and the blue arrow to Fátima pointing the opposite way. You can barely see the yellow Camino de Santiago arrow in the photo of this waymarker, just below the bold blue arrow. It is said that if you do not understand the phenomenon of Fátima, you will not understand the Portuguese culture. If you are unfamiliar with Our Lady of Fátima, it is the name for the Blessed Virgin Mary given by the Catholic Church in 1917, after three young shepherd children saw her as an apparition, in a field in central Portugal. 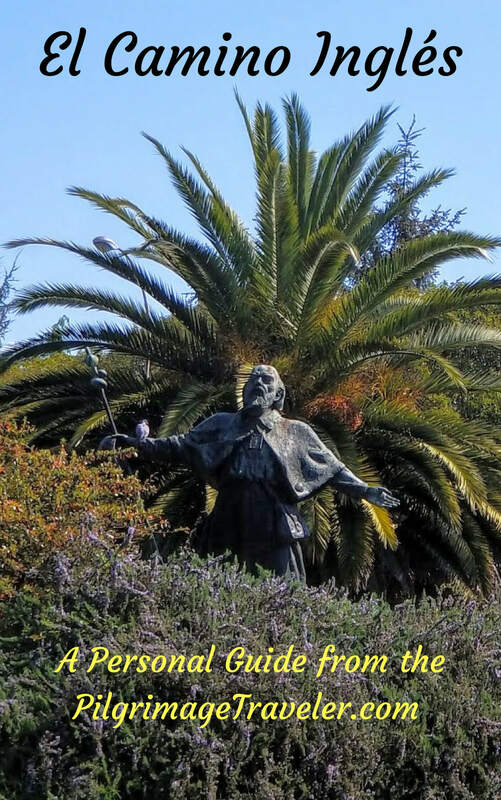 There is a shrine to her in the location of the visions, in the town of Fátima and one can see her image throughout Portugal, and even in Galicia. 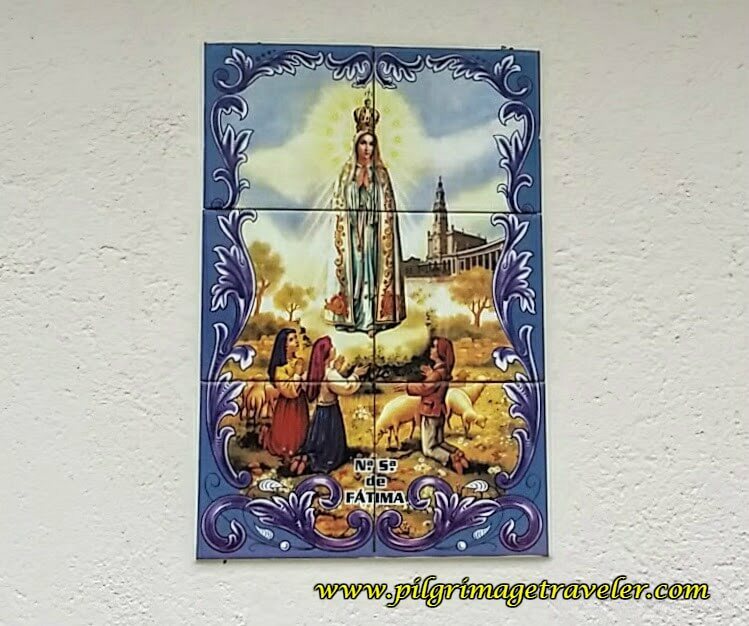 Fátima is very easy to spot, as she wears a crown on her head, and often is depicted with the 3 children kneeling before her, as in the photo of the mural. 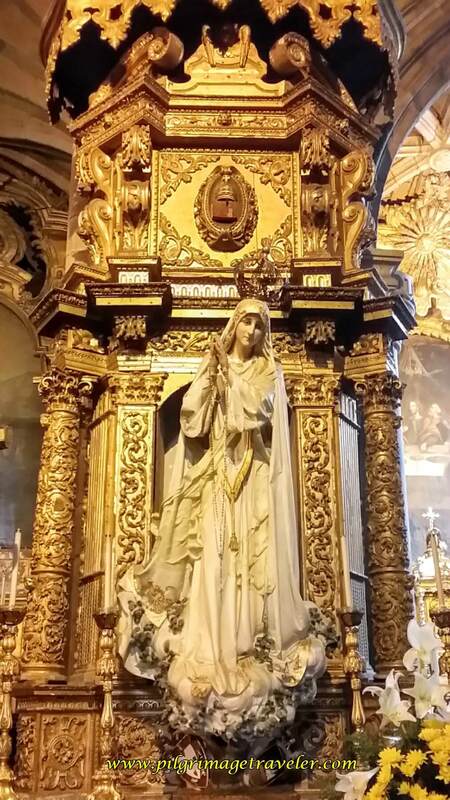 Almost every church has an altar to her, and I even spotted her in the cathedral at Santiago! She is highly venerated among the Portuguese Catholics. 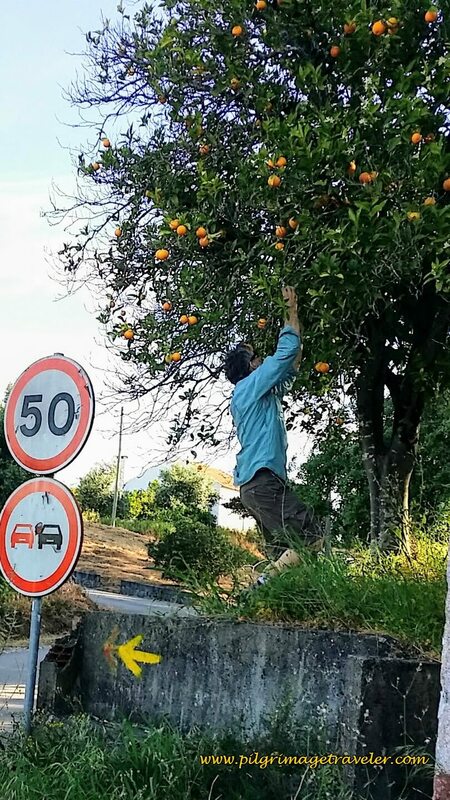 Springtime Oranges and Lemons: One of the incredible delights on the Camino Portugués from Lisbon to Porto, in April, were the orange and lemon trees. We passed by one abandoned tree after another, where the fruit was just falling unused to the ground. We would eat 2-3 oranges everyday, just by finding them along the Camino! 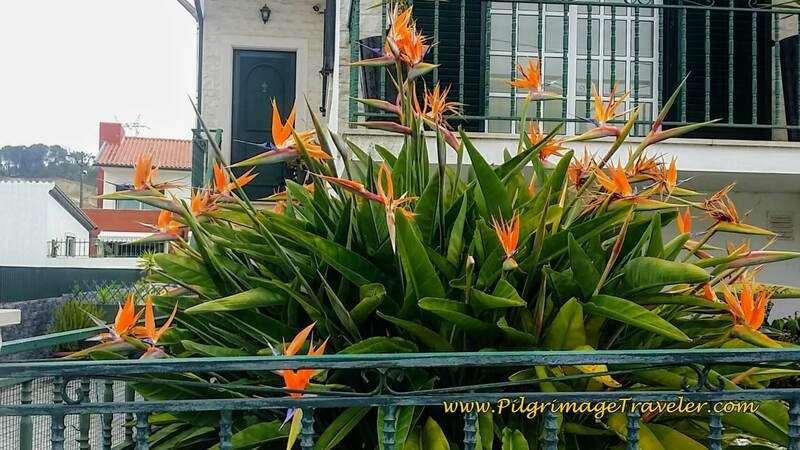 Tropical Flowers: The springtime aroma in the section from Lisbon to Porto was nothing short of fantastic! Flowers were in bloom everywhere, and we were surprised and delighted with the many, many tropical varieties that we saw. Calla Lilies were growing wild everywhere, Bird-of-Paradise, Christmas Cactus, Alstroemeria, and many, many more. The tropical flavor of Portugal is one one the many unique aspects of this Camino. 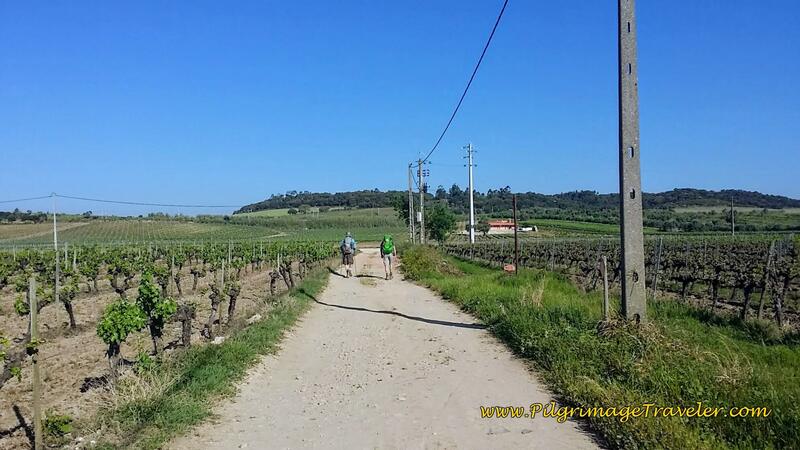 Wine/Food: While Spain also has delicious wine, the Camino Portugués from Lisbon to Porto walks by field after field of grape vines. They have uniques types of grapes here, the wine is very inexpensive, and if you don't ask for wine with dinner, they think you are nothing short of crazy! The food is unique as well, with many unfamiliar dishes, and much more variety. 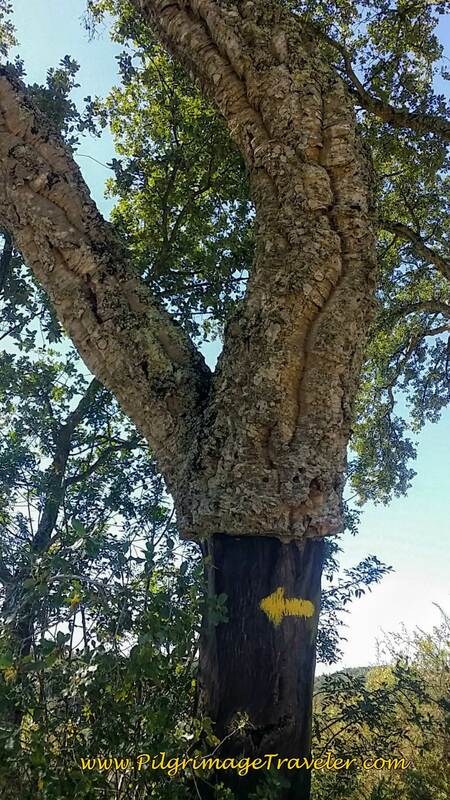 Cork Trees: Unique to Portugal are the magnificent and majestic cork trees. Keep your eyes open for them as you walk the Camino Portugués between Lisbon and Porto. You can also see purses and souvenirs made of cork, for sale throughout Portugal. Only the bark is stripped from the tree, allowing it to be harvested every nine years. Since cork is not endangered, support the country by buying these products. The greeting along the Way is not Buen Camino, but Bom Caminho, said like bong camEENyo. You will also frequently hear their version of bon voyage, or Bom Viagem, said like bong veeAJe, with the "j" as the ge in garage. Good day is Bom Dia, or bong DEEa. 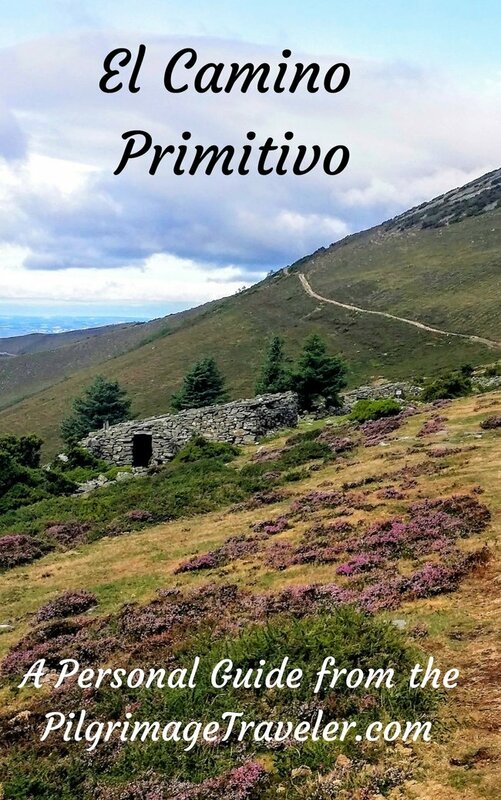 You have already read above, the Camino Portugués is filled with wonders, most notably the longer, 400 km section from Lisbon to Porto. 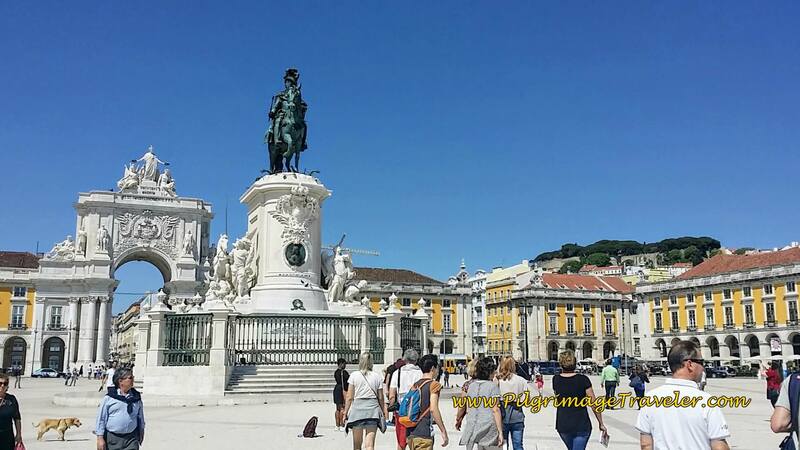 It is said that once you leave the touristy city of Lisbon, it is only then, that you encounter the "true" Portugal. I wholeheartedly agree! Portugal is worth exploring, in its every nook and cranny, that is beautiful, fruitful and full of history. Yes, the stages are long with less support services than the section after Porto. However, in my opinion, a true pilgrimage should never be without a bit of hardship, will and determination. With just a bit of extra planning regarding shortening your stages if needed, always carrying plenty of water and food, you will be just fine! Unlike the Camino Francés, you cannot just put your brain on autopilot, expecting things to appear shortly after you need something. Plus the Portuguese are so willing to help if you need it! If the one thing I would advise here, is that you do have a phone service that you can call the Via Lusitana SOS number, if you get into trouble. It is 915-595-213. 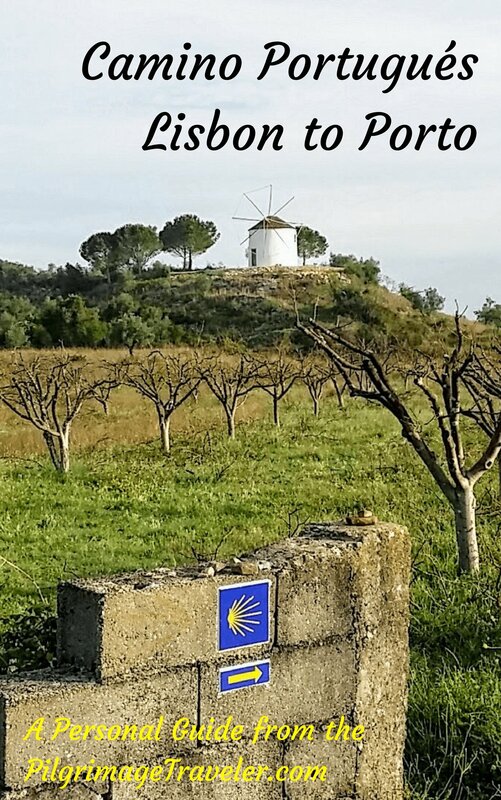 They are the organization that supports and maintains the Camino Portugués. I heard from many pilgrims on Facebook and the Camino Forum that we would be walking through lots of ugly industrial areas, especially when walking out of Lisbon. Yes, we did walk through a few industrial zones, but it was never for long. And we were pleasantly surprised at the walk out of Lisbon, along the Tejo River, on promenades and through the old 1998 World Expo site. It was nothing like I had expected and quite pleasant and cool along the river. 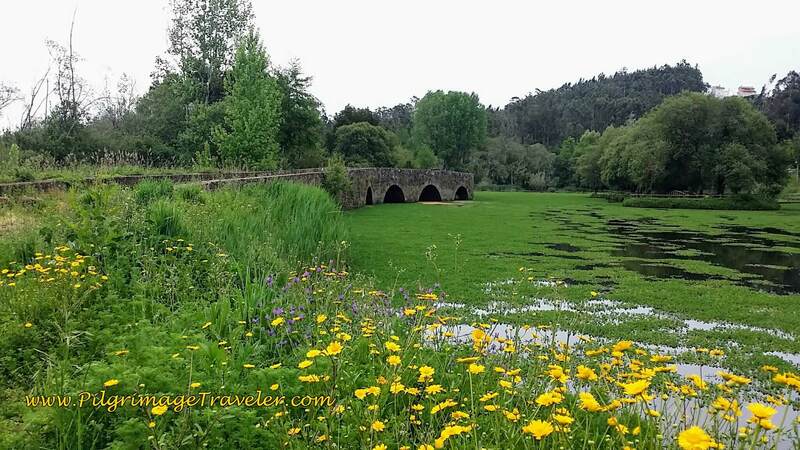 Please feel free to click through to see my Day One on the Camino Portugués to see for yourself! I wore light and loose, long sleeve shirts to protect myself from the sun. My pants were too heavy to wear, or I would have worn pants as well. Sunscreen and sun hats are mandatory. I would even wet down a bandana to tuck under the back of my baseball cap to cool myself off! Make sure you have plenty of water if you do this! 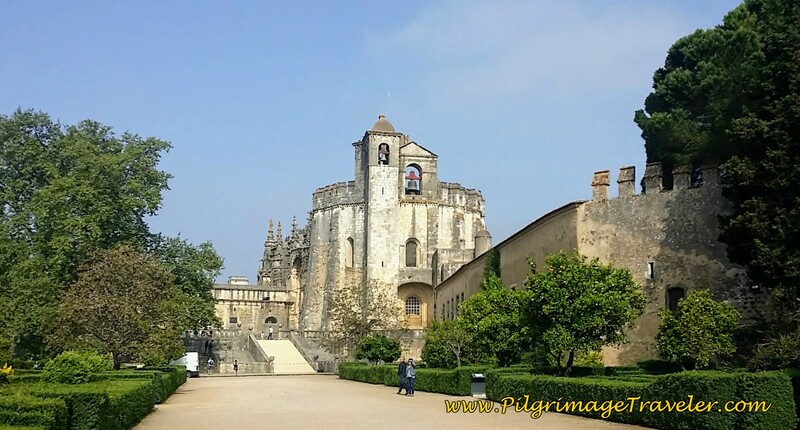 There are lots of great towns and sights between Lisbon and Porto; Santarém, Tomar, Coimbra, and plenty of medieval and Roman bridges, Roman roads and the ruins of Conimbriga along the Way. The ugly truth along the Camino Portugués, is that there are really, really fast drivers. Indeed there are stretches along very busy and/or narrow highways that one must not ignore the danger. In fact, one could take a lesson from the Fátima pilgrims, who all wear fluorescent-striped traffic vests when they walk! And they are Portuguese! The Portuguese drive so fast and come so close to the pedestrians, that an old saying I learned from a young farm boy in high school who drove the same way, continually came to mind: "An inch is a good as a mile!" Yes, in Portugal, an inch IS as good as a mile! Step aside when the road is extremely narrow when a car approaches, if at all possible. The time you lose may save your life. Wear visible clothing - bright colors or safety vests. Stay alert at all times, keeping music out of your ears, so you can hear oncoming traffic, from both directions. 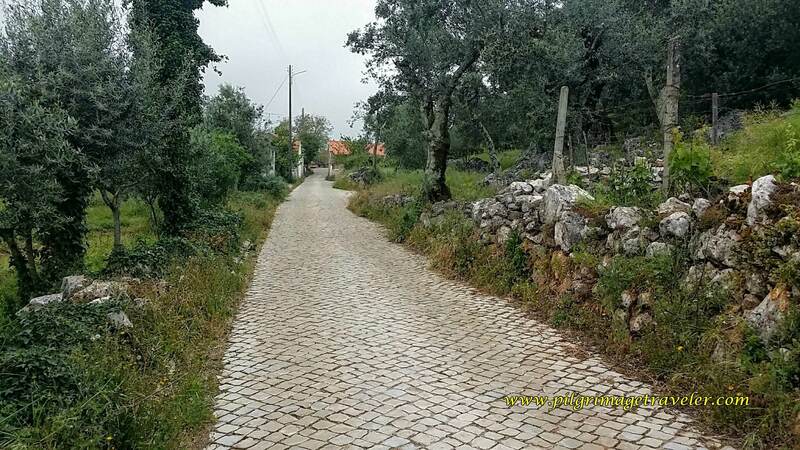 No matter how wide the road, it seemed like the Portuguese take their half out of the middle, every time, and severely cut corners around bends. second, when a blind curve is ahead, when you are walking facing the traffic, it is safer to cross the other side until you pass the blind curve. I was amazed at how frequently I saw pilgrims walking out into the road, on both sides, ignoring the traffic. Not only is this discourteous to the natives who have to deal with pilgrims every day, but you are truly taking your life into your hands. Pedestrians may have the right-of-way, but speeding drivers do not have sufficient time to react! While there are sections of road walking, I felt it was not that horrible. The reason it feels horrible is the speed of the drivers. Most drivers are Monte Carlo wannabes! 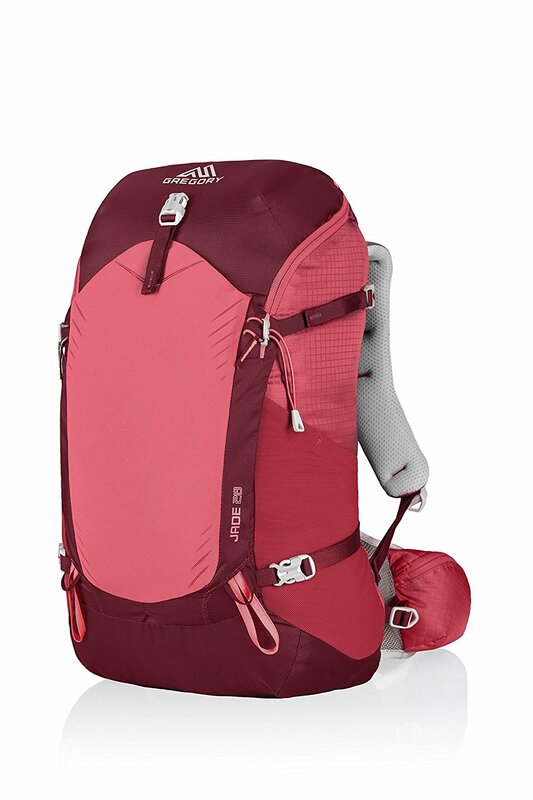 If you do the Camino Portugués, please wear brightly colored clothes, or a safety vest. It will be money well spent. Another very different aspect of the Camino Portugués from Lisbon to Porto is the lack of throngs of pilgrims. For us, at least in April, it was mostly a solitary walk. We met very few other pilgrims, and few Americans! This is good or bad depending on your point of view. What I can guarantee you is miles and miles of solitary farmland that will lead you into reflection, if that is what you seek. In Portugal, the pilgrimage to Fátima takes precedence. The Portuguese don't understand why you would want to walk to Santiago and not Fátima! This is an aspect of their culture in which you will have to adjust. Especially if you are hooked on the Camino de Santiago - which we all are! Despite these few pitfalls, I can say with my whole heart that the section of the Camino Portugués from Lisbon to Porto, all 400 kilometers of it is worth it! Just do it! Adapting to what is, is the way of the pilgrim after all, isn't it? The Camino Portugués is most popular after Porto. We found it to be a totally different Camino than the section before Porto. With so many new pilgrims starting here, and so many different routes to choose, with many diversions back and forth between the routes, we were seeing new faces every day. The Central Route is the most traditional and most historical route. From Pontevedra, Spain there is yet another route called the Variante Espiritual. There are not many English sites describing this variation, but several of our compadres chose this way and we never saw them again. This Route has a Facebook page, click here to see it. There is the Coastal Route which has been gaining popularity in more recent years. There is some discussion regarding whether or not this route was an official pilgrimage route in medieval times, but there is some evidence that shows that it may have been used. Thirdly, there is the Senda Litoral which literally hugs the coastline on boardwalks and on the beach. There are few arrows on this route and you must be more adventurous and self-guided to feel comfortable on this one. You literally just keep the ocean on your left! There is a large project underway to build trails and/or boardwalks along the entire Senda Litoral, but it appears that it will be many years until it is completed. At times the Coastal joins the Senda Litoral, but mostly it does not. At times on the Senda there is absolutely no route to follow except along rocky coastline, rivers and marshes, so we only followed the Senda Litoral when there were boardwalks or established, paved trails. Several times we did choose to walk several kilometers on the beach, but only if it was hard packed and easily accessed. The Senda Litoral is almost always longer than staying on the Coastal Route, and it often depended on how tired we were or how far out of the way it was, which route we chose. We also felt like the weather would have also influenced our choice. Wind and rain along the coast is not very pleasant, but we we lucky and had mostly gorgeous weather. As you can see below, the coastline boardwalks are quite nice and very inviting! For us the hardship of few arrows was outweighed by the ability to follow the coastline. We are from Colorado, so this was important to us. It is all a matter of preference! Please be aware that any Camino is a fluid thing, always changing! If you find that any of our information is incorrect, we warmly invite you to contact us and let us know! This will help all future pilgrims on their journey and will be greatly appreciated by all! 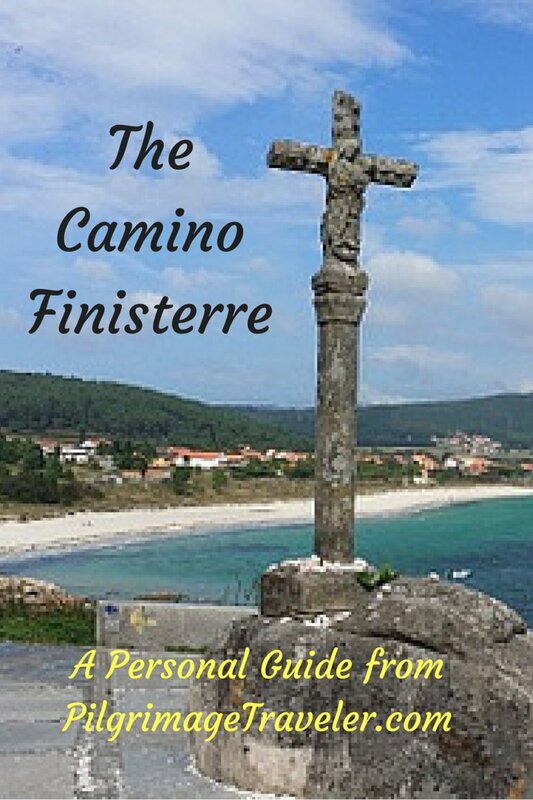 What Does Your Camino Portugués Look Like? I hope our introduction to the Camino Portugués has helped you in your own decision-making process. I will continue to add articles of each and every leg of our journey, as I can. It was truly unique from the others we have done. I promise you that I will give you the good, the bad and the ugly! May your pilgrimage roads be full of wisdom and direction! May you always be mindful of how you impact the landscape, the culture and your own life! 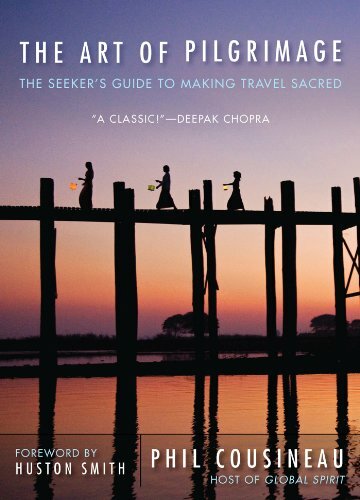 May you be the pilgrimage traveler who is aware of all that is around you!